Hoffman Steam Air Vent. Float-type vent 1/8" NPT angle connection Single non-adjustable port Maximum operating pressure 6 PSI For ordinary one-pipe system that doesnt require proportional venting Steam Air Vent. 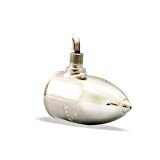 HOFFMAN STEAM AIR VENT 1/8" NPT. RADIATOR AIR VENT. 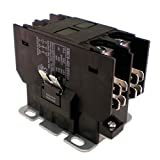 This contactor is a heavy duty enclosed replacement for Trane and American Standard two pole contactors rated at 35 Amps or 40 Amps with 24 volt coils. This contactor is rated at 40 Amps and has a 24 Volt coil. 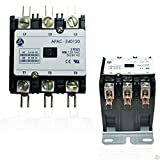 This contactor has a heavy lug screw terminal and 4 male quick connect ¼" terminals on each line voltage connection to provide maximum wiring flexibility. The two terminals for the low voltage coil each have double ¼" male quick connects. The contact mechanism is enclosed to keep out insects and debris, but the visible plunger provides positive verification that the contacts are pulled in. The mounting base measures 2-5/16" X 1-15/16" with four oblong mounting holes 1-5/8" x 1-5/8" on center. There are also four slots in the base to provide many mounting options. This part replaces Trane American Standard part numbers CTR 1155 and CTR01155. This part is covered by the exclusive OneTrip Parts® two year limited replacement policy. If this part fails within two years from date of purchase, return the defective part and a copy of the original invoice to the place of purchase for replacement. Contact the authorized OneTrip Parts® dealer that you purchased the part from for details. Original equipment manufacturer's brand name(s) and part numbers are used for identification purposes only. This item is supplied by OneTrip Parts® and meets or exceeds original equipment specifications. Heavy Duty Contactor 3 Pole 40A 120V for A/C, Heat Pump and Other Applications. Will Work On All Brands, Trane, York, Carrier, Rheem, Lennox, Amana, Ruud, Tempstar, American Standard, Janitrol, Goodman, Confortmaker, Bryant, Gibson, Heil, Coleman And Others. For larger applications, the MovinCool Classic 40 portable industrial cooling unit can create flexible, mobile or temporary cooling in factories and warehouses. Using multiple T-section drops, you can customize an adaptable portable air conditioner solution for your manufacturing or assembly lines. Add an optional wagon kit or casters to the units and you can move the cool air as your assembly or process line changes. By cooling only the area that needs it, the Classic 40 industrial air conditioning unit saves you money while protecting people and equipment and speeding up processes. 39,000 BTU cooling capacities to handle any hot spot. Rugged design... proven durability since 1982. Less than half the cost of central air conditioning... no costly installation is necessary. Operates on 460V power.